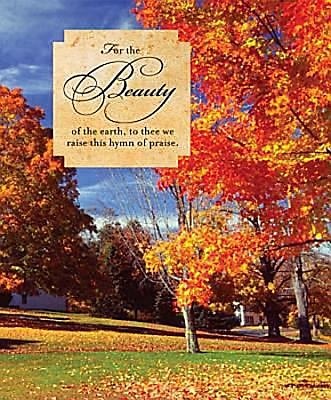 to thee we raise this hymn of praise. The beauty of the earth is displayed in the brilliant colors of fall. Bulletin is 8 ½” x 14” unfolded, and 8½” x 7” folded. It is also available in regular size, which can be found in the Related Products Section below. Abingdon’s Advent-Christmas 2011 Seasonal Bulletins and matching pieces provide a beautiful array of designs to enhance seasonal worship services and special communications with your congregation. This annual series includes bulletins, letterheads, and offering envelopes for all four Sundays in Advent, and several options for Christmas Day as well as bulletins for special services such as Hanging of the Greens, Candle Lighting, and Watch Night. To see our full selection search by typing keywords: Abingdon’s Advent-Christmas 2011.